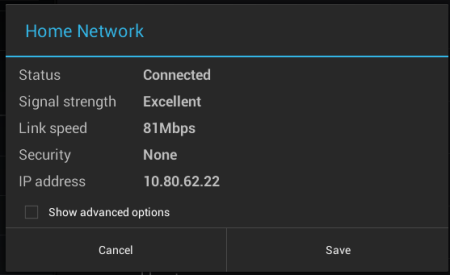 Long press your current Wi-Fi connection until new window will be shown. Select “Modify network”. In window with current connection settings check the box “Show advanced options”. To finish setting enter Dashboard on our site and attach your external IP address in Settings section - Nets tab to your Default profile. Your current external IP is shown in left column on the same page. You can copy it and paste in input box and choose profile for this address. Press “Add” to attach it. WhenIP address is attached it can be unattached at any time by pressing cross right to it. 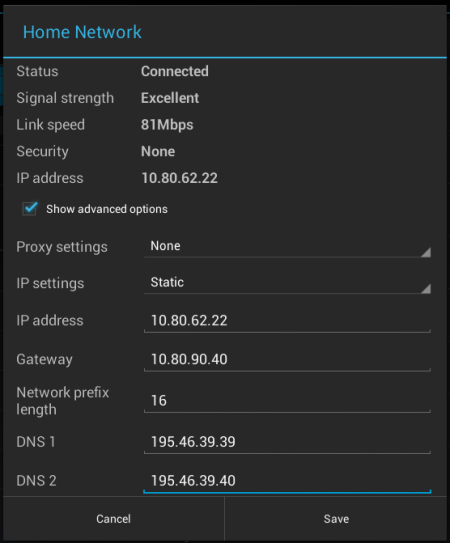 If your Wi-Fi connection use dynamic external IP then you need to use paid plan and attach your Dynamic DNS hostname instead of static IP.